He shared a stepfather with Jackie Kennedy and twice ran unsuccessfully for office. 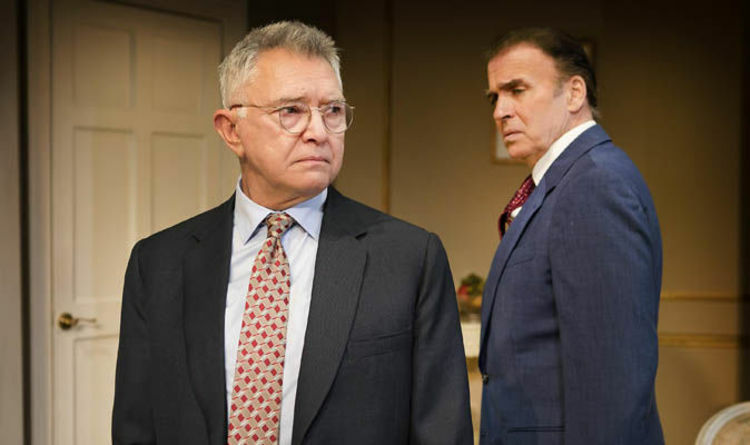 It’s really no surprise that his 1960 play The Best Man, a tale of wheeler-dealing at a fictitious Democratic convention, has the ring of truth – or, given the ubiquitous corruption, the reek of authenticity. Rival candidates William Russell, an honourable statesman with a history of depression (Martin Shaw), and Joseph Cantwell, a thuggish populist with a sexual secret (Jeff Fahey), fight it out in a Philadelphia hotel to gain the party’s presidential nomination. Throw in a dying former president (a gleefully malevolent Jack Shepherd), a power-broking woman delegate (a deliciously disdainful Maureen Lipman), the candidates’ respective wives (Glynis Barber and Honeysuckle Weeks), and various aides and reporters, and the hotel doors swing back and forth as furiously as in a Feydeau farce. Vidal’s sympathies are clearly with Russell, a “brilliant, witty, aristocratic, intellectual,” who sounds like a self-portrait. Keeping to a well-made-play structure, he ratchets up the tension as to whether Russell will fight fire with fire right up to the final curtain. Simon Evans’s production is richly detailed, perfectly paced and splendidly cast. Given the current state of US politics, its revival could not be more opportune. There is less to applaud in Stephen Beresford’s take on Ingmar Bergman’s masterpiece Fanny And Alexander which, like last week’s Harold And Maude, is a pale imitation of a filmic original. Oft caricatured as a purveyor of Nordic gloom, Bergman made several life-affirming comedies, none more so than this 1982 semi-autobiographical portrait of an acting dynasty seen through the eyes of the titular children. Beresford’s adaptation is clunky. It’d be wrong to expect him to recreate Bergman’s lavish period interiors or the play of light and shadows so fundamental to his art, but he should have done more than simply fillet the film for key episodes, thereby failing to create a distinctive theatrical rhythm. He’s at his best in the actors’ rehearsal scenes, in which Penelope Wilton is gloriously funny as the semi-retired matriarch. But his interpolations (in particular, the scythe-wielding figure of Death taken from Bergman’s The Seventh Seal) are painfully ill-judged. Moreover, the long passages of amplified narration seem like an admission of defeat. Max Webster’s production contains fine performances from Michael Pennington as a benign Jewish shopkeeper, Kevin Doyle as a repressed and repressive bishop, Jonathan Slinger as a philandering restaurateur, along with a remarkably assured one from Guillermo Bedward as Alexander at the performance I saw. Bergman, a consummate stage as well as film director, would never have brooked the clumsy scene changes, clichéd tableaux and sluggish pace. It’s 30 years since I saw the film but many of its images remain with me; I doubt that any of these will last 30 days.